Hello!! Welcome back to the newsletter, I am so excited you are here and joining me on this journey. As many of you know, this year, 2018, is the year of wellbeing for me. I have moved to the forest for calm, peace and restoration, whilst also giving my creativity lots of space to explore and go a bit wild! As a knock on from this I am eating well, juicing every day, swimming every weekday and really listening to what my body needs! So, why am I boring you with all this? Well, I wanted to fill you in on some little tips, and one of these is the way we sit! I know that working from home, sewing, crafting and updating online content can make us (me) a little slack in the old ‘sitting up straight’ and ‘remembering to take a break and go for walks reguarly’ department. So, after much deliberation and research, I decided to use my yoga ball as my seat for all these activities – I even use it at the sewing machine! You do have to get yourself in the right balance first but once you can you are off! It’s great for movement, working on your core as you craft and doing little mini exercises! If you are worried about stability you can get ones with stabilisers to hold in place, just do a bit of research.. 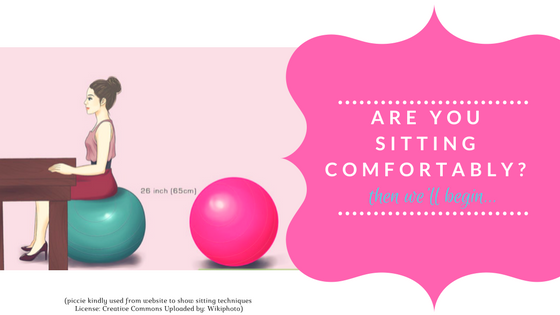 I would love to know how you keep yourself in shape at your desk / craft space and if you have a special chair or if you would consider using a ball! It’s a bit of fun too! 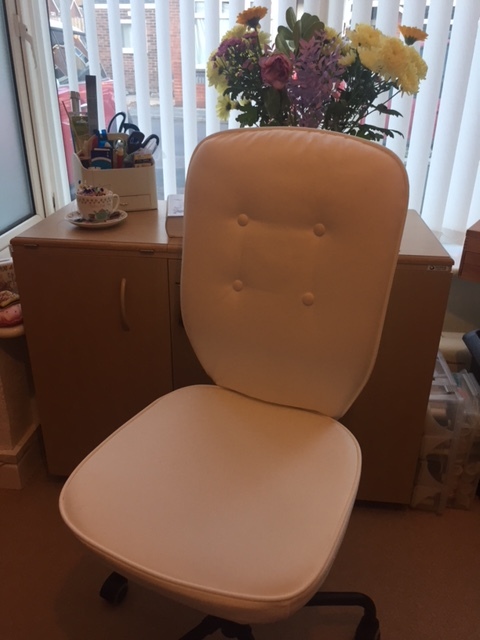 “it is a cheapy from Ikea, I did have a big office chair with arms and tall back, but so often felt I was sitting on the edge and couldn’t get close to my desk/machine because of the arms (although they could lift up). So this is a nice new one, quite firm base, on roller balls so moves around easily. It can raise up and down to suit the height I want and has an upright back which supports my lower back. Not yet used it when sewing, but think it will be good. It was about £55 (so much cheaper than office chairs). And the covers are removable so can be washed” – Now that is a great tip – thanks Wendy! 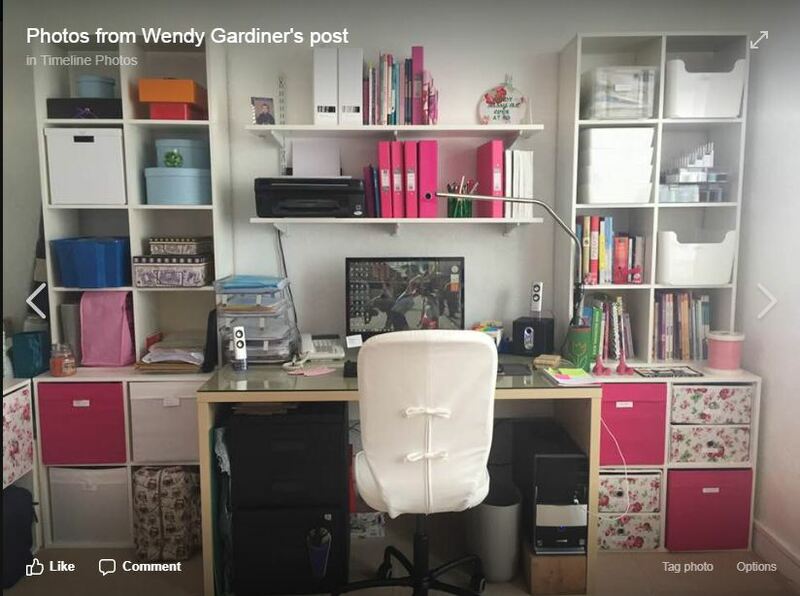 So if you have a story about your chair, how you sit in your workspace do let me know – I’d love more ideas! And the winner from last weeks #wednesdaywin competition is…. Fiona, thanks so much for your entry, I love that you will take your new skills onto volunteering at fun palace and local art centre, I believe that they will absolutely benefit from this, so thanks! Runners up – I am sorting some more so please keep your eyes on the news! Today I would love to know what you would like to make from fat quarters! I am set to do some super simple ‘how-to’ videos soon and I would love to know what you would like to see made out of these lovely fabrics.. The best suggestion gets a #wednesdaywin pack of my favourite Hobbycraft / The Craft Cotton Co. 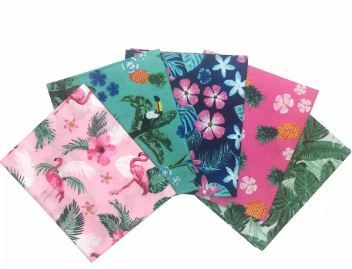 Fat Quarters ‘tropical palm tree’ in the post!